INDICATIONS: Strong escharotic, dehydrating and sclerosing agent. 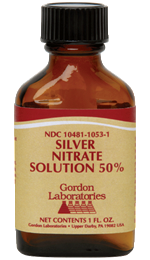 ACTIVE INGREDIENT: Each fluid ounce contains 15 grams of Silver Nitrate. DESCRIPTION: Colorless, odorless, transparent solution used topically as a cauterant, and as a strong escharotic, dehydrating and sclerosing agent. PHARMACOLOGY: When the concentration is high, membrane and intra-cellular structures are damaged, and there is a caustic or corrosive effect. Because silver ions attach so readily to the various active groups on proteins, the silver ions are captured before they diffuse far into the tissues. Precipitation of Silver as Silver Chloride also limits the extent of movement of the ions. Thus, the local effects of silver are self-limiting, and the spread of damage occurs only when the dose of Silver overwhelms the capacity of the tissues to fix the ion at the site of application. The antiseptic effects of silver probably also derive, in part, from the reaction with bacterial and viral proteins. DIRECTIONS: Apply to area or lesion with a cotton applicator dipped in solution two or three times weekly for two or three weeks as needed.